I happened to be walking along Haig Road when I heard from afar, the approaching RnB music blaring at volume. There are quite a few characters who lived around Haig Road who do that while riding, so I didn’t give much thought to that. As the music got closer, an UberEats cyclist was riding with a small speaker attached to the top of the UberEats delivery box, appeared. No fancy lights from his bicycle but the Tock Tock Man came to mind. The Tock Tock man was well known in the 60s and 70s as the noodle delivery guy, except he cooked on the spot. His signature tune was a constant Tock Tick Tick Tock, Tock Tick Tock, which was also used in advertising by a local instant noodle manufacturer. The trademark sound was created by knocking a solid core stick against a slip of bamboo. UberEats as the new Tock Tock Man? Who would have thought! 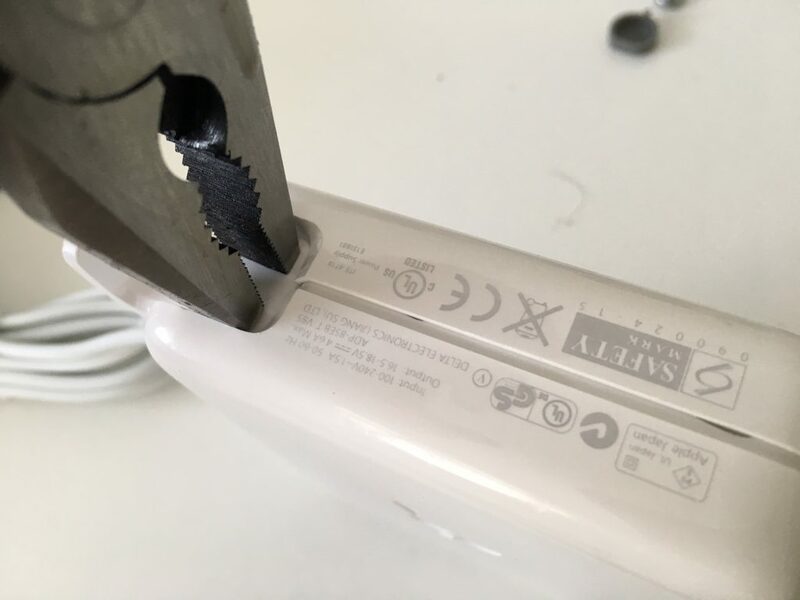 ATTENTION: Opening the AC adapter means you are voiding the warranty provided by Apple. In case of any accidents, fires or mishap, you will hold me harmless against all liabilities, lawsuits, etc. Aesthetics here means I want to keep it as Appleque as far as I can, even after a good working repair. Unlike other tinkerers, I’m not in favour of using superglue (cyanoacrylate, err) to glue the two halves together. 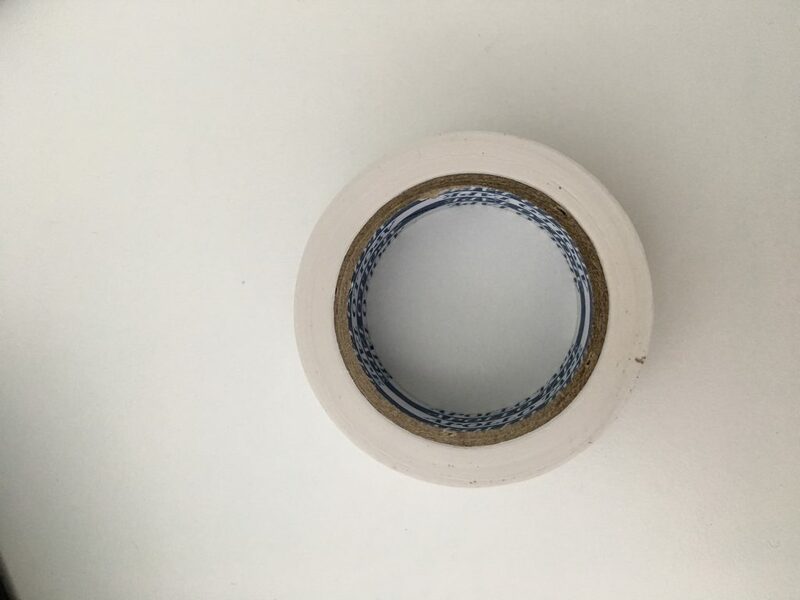 Instead, I’ll be using a roll of white vinyl electrical tape, easily found in most hardware stores. Inspect the replacement charging cable stopper attached to the ac adapter. Make sure its seated properly between the two halves. Then take care to press the two halves of the ac adapter together to ensure a tight fit. 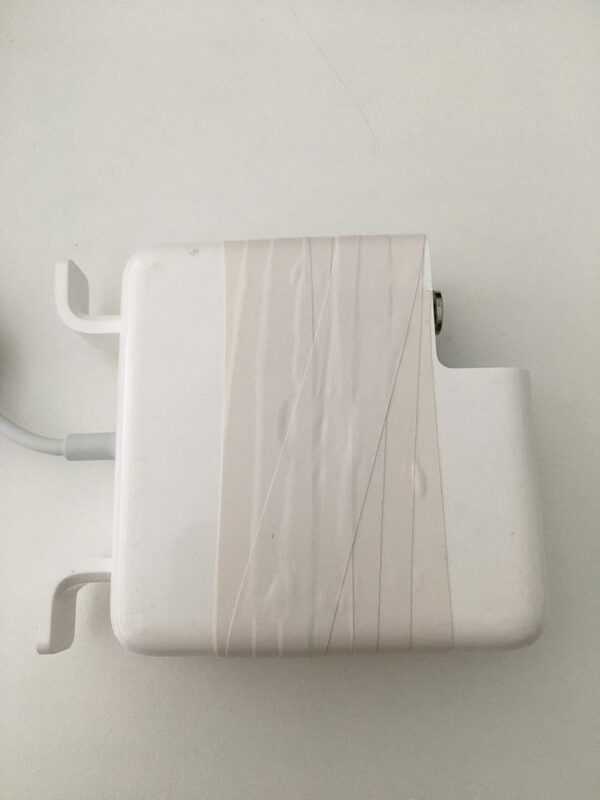 Wrap white electrical tape around the ac adapter as many times as required. We will desolder the two terminals in this part. 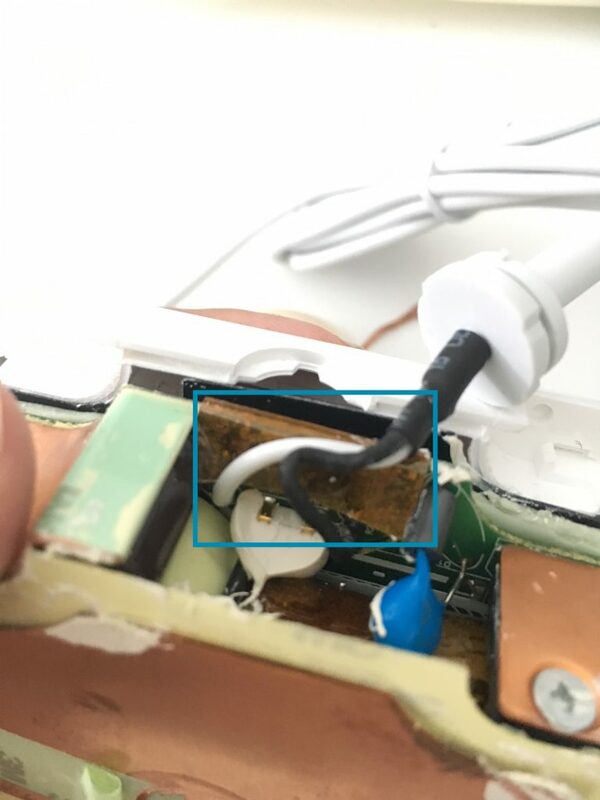 The original Apple ac adapter has a green wire soldered to the positive (+) and a black wire soldered to the negative (-). 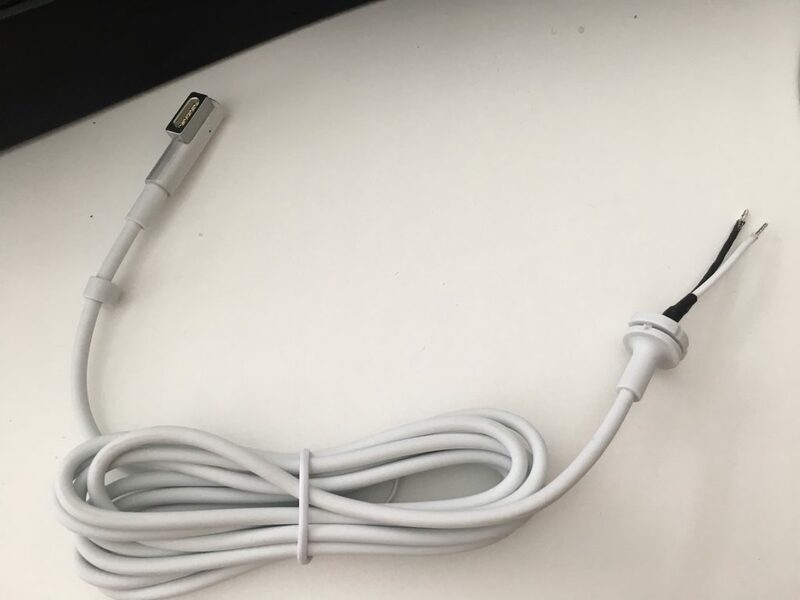 My replacement charging cable used white colour to denote the positive terminal and black colour to denote the negative terminal. 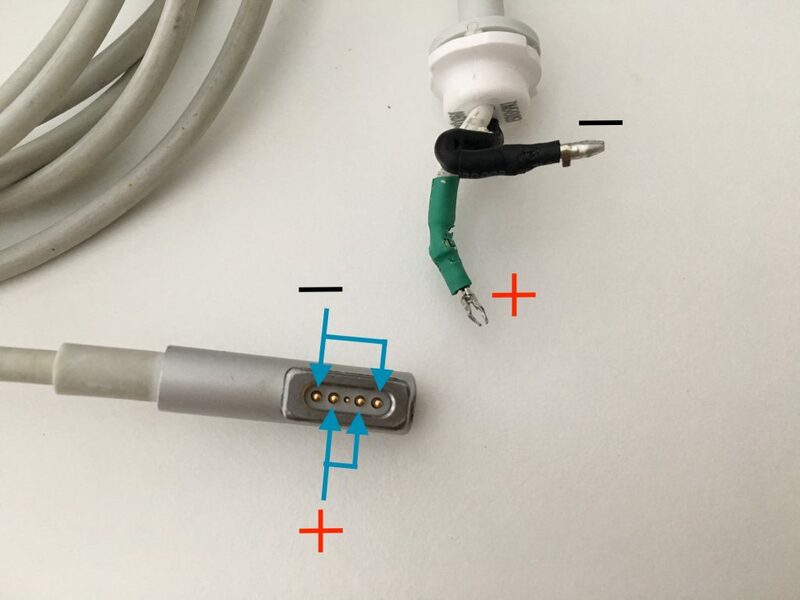 We need to verify the replacement charging cable’s polarity before soldering the replacement cable onto the adapter. Now that you have ascertained the polarity. Time to desolder the old charging cable. 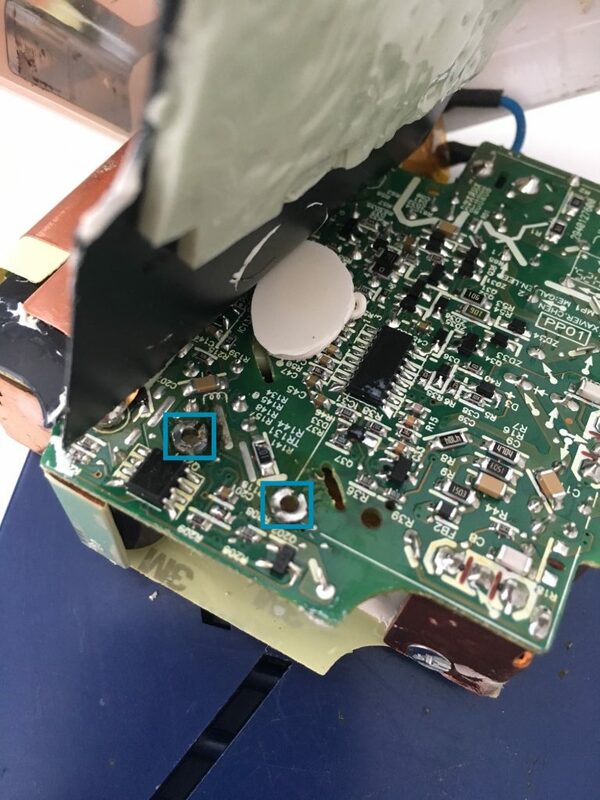 Let us have a quick recap on the terminals we need to desolder. 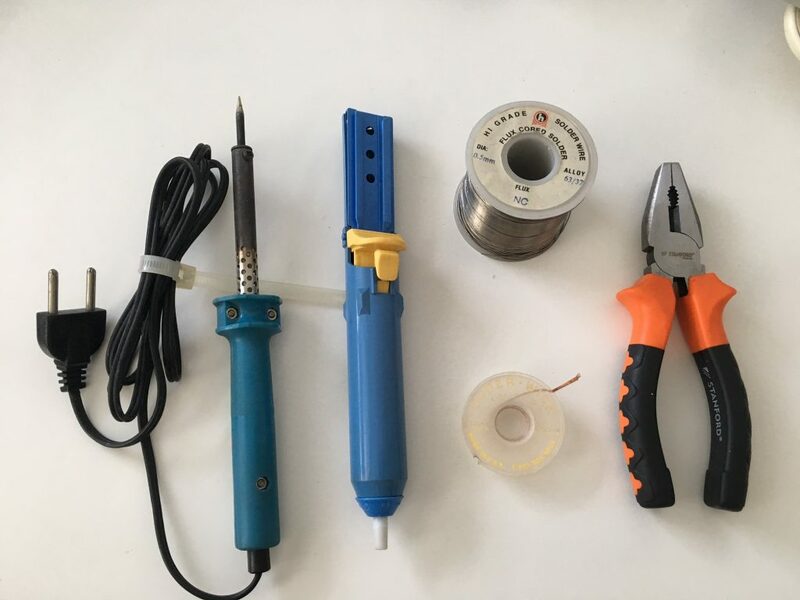 Using the soldering iron, heat up each point at a time and remove the flux using the solder sucker / desoldering wick. You should get this. Two clean circles where the original points were . You will be able to see this from the underside. 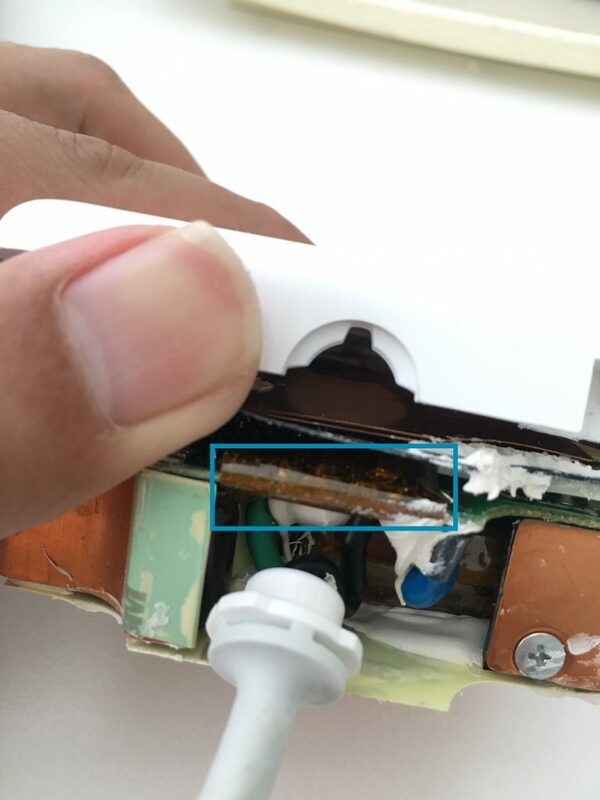 Notice there is white gunk surrounding two connectors, you should not see this if you didn’t remove the gunk – and you should not remove this ‘gunk’. Soldering the replacement charging cable back on the two terminals. Testing time. But first to put the adapter block back into the casing. 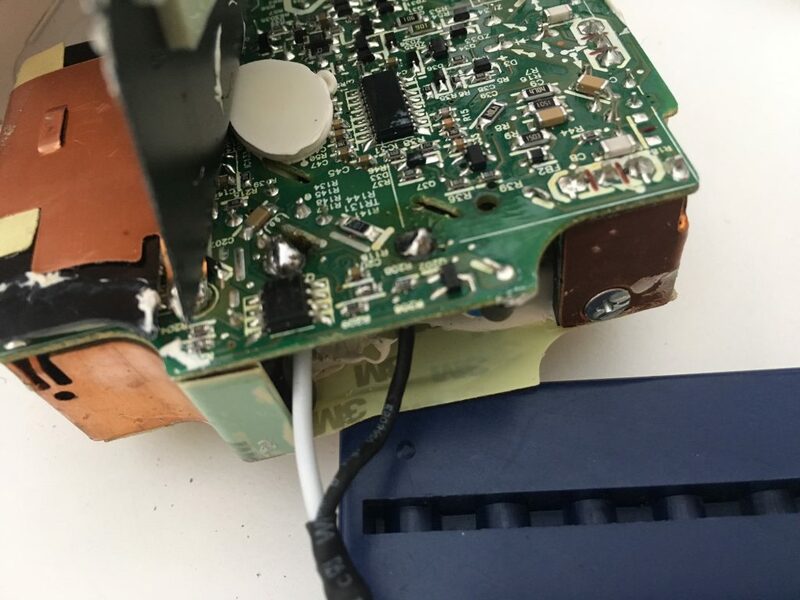 Remember to cover the two re-soldered terminals using the orange tape. Gently slot the adapter block back into the white casing, as shown below. 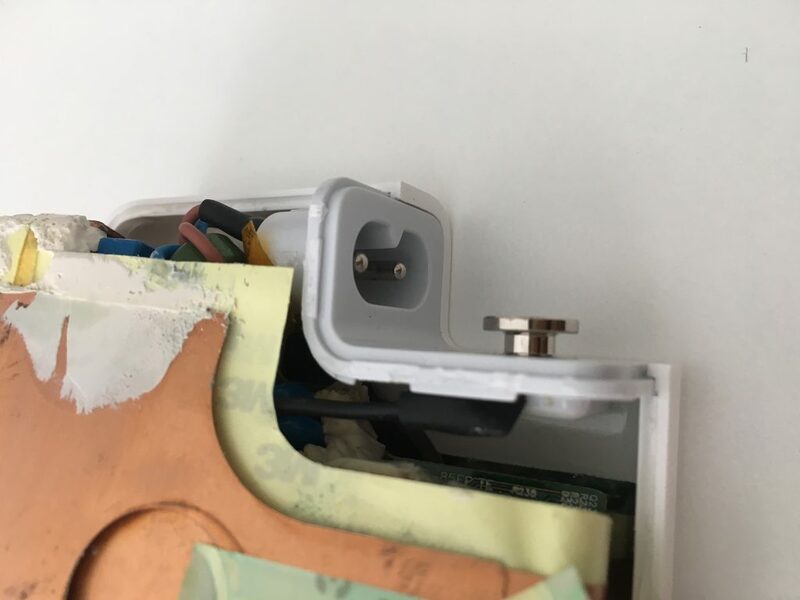 Note there are grooves in the replacement charging cable stopper (flange) that needs to be aligned with the two halves of the plastic casing for a good fit. Next to Part 4 for adhering the two halves of the adapter together. 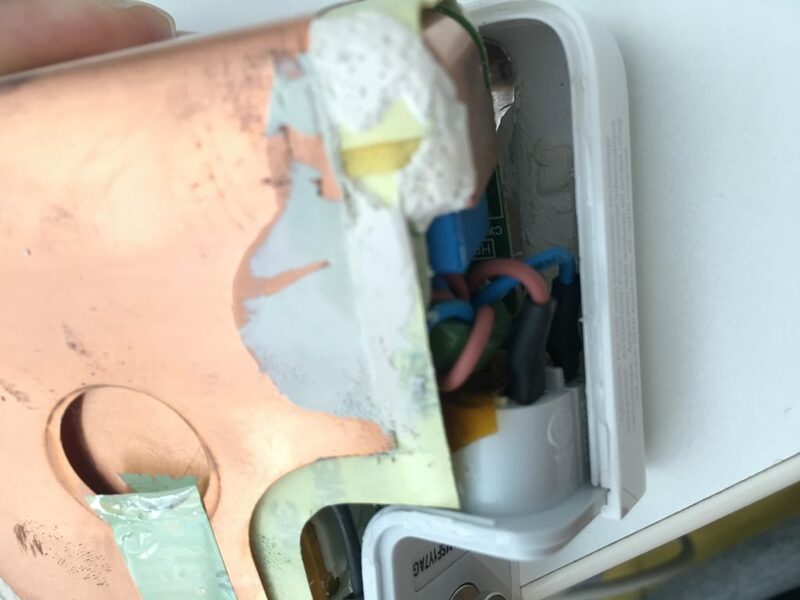 Disassemble the adapter by opening it with pliers. 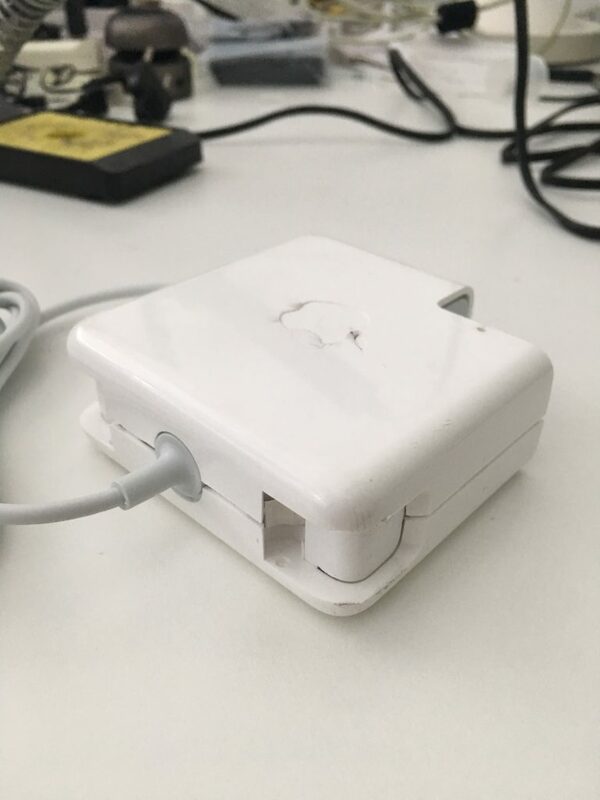 You will need a bit of strength to open the adapter. 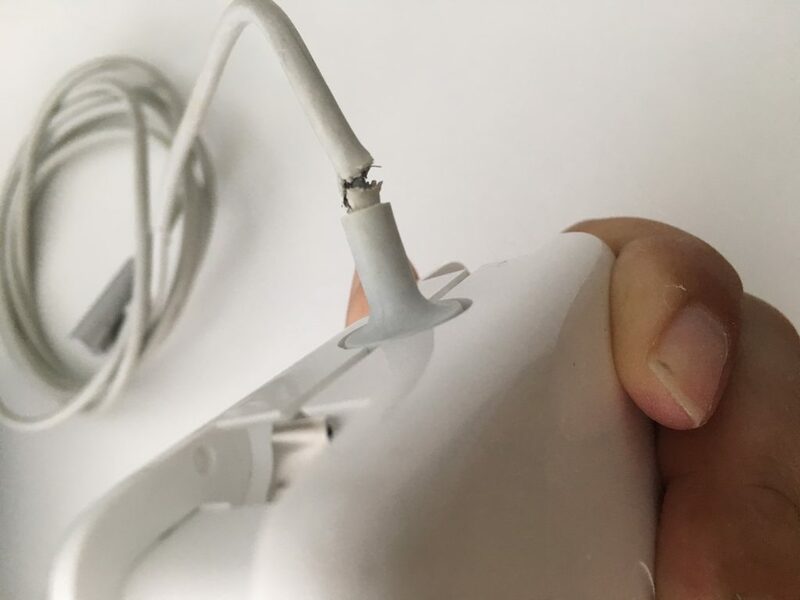 DO NOT to whack the adapter against any hard object in hopes the glue will give way. IT WILL NOT. This is how I opened the casing. This is the aftermath of removing one half of the cover. The green strips are 3M tape to hold the copper shielding together. 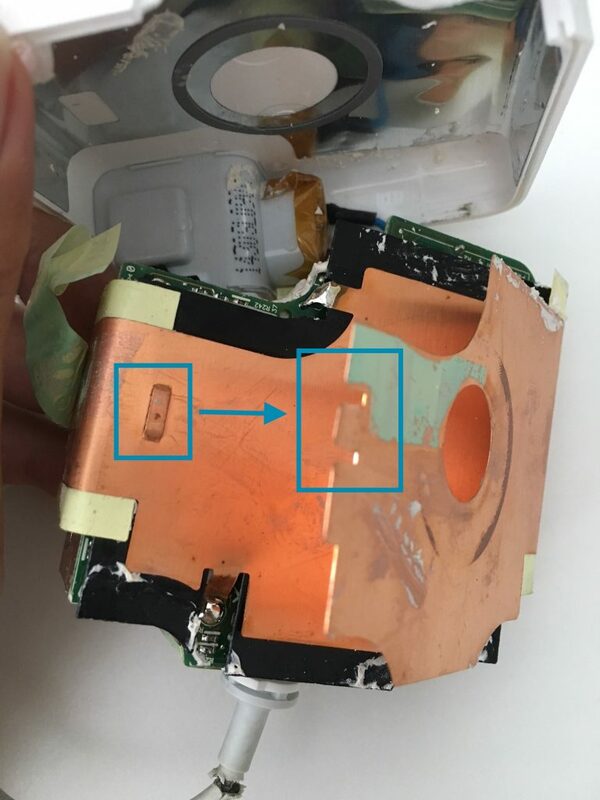 Depending on the position of the soldering connectors, you might need to remove the copper block from the white plastic casing. 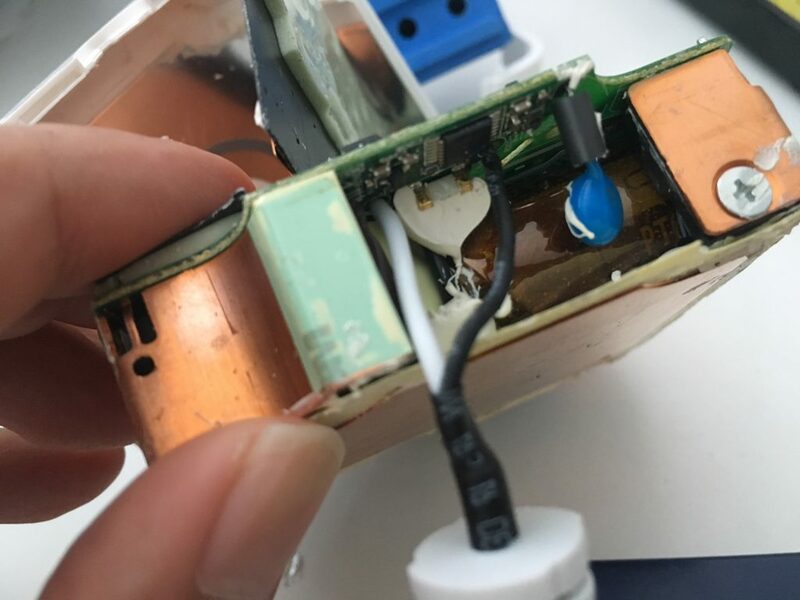 In my case, the casing opened on the wrong side (the soldering connectors were only accessible from the other half of the casing), so I had to remove the other white casing to get to the connectors. How would you know which is the correct side? Look for the orange tape. 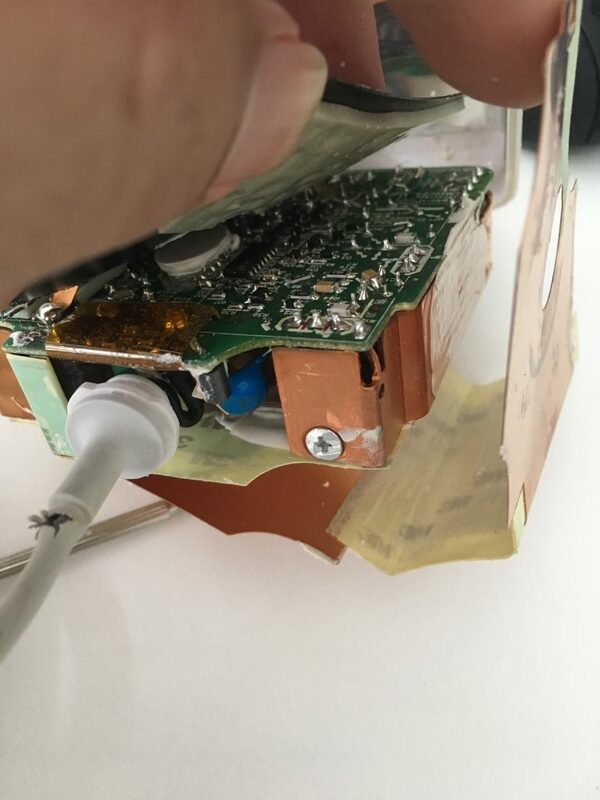 You will need to remove the orange tape to get to the soldering connectors. Above shows the white casing opened from the wrong side, thats why I had to remove both sides of the casing. 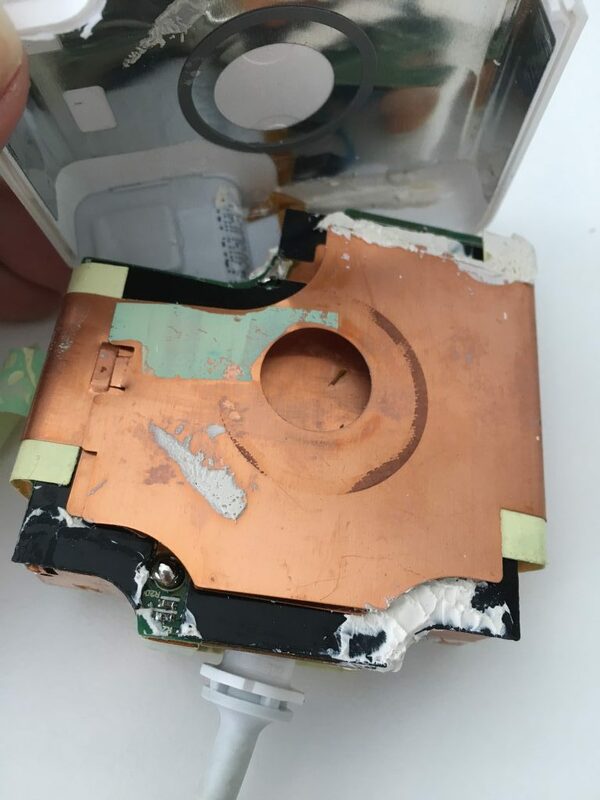 Before cracking open the other side of the casing, you will need to be careful as the other side will connect to the external connectors. By the way, the white gunk appears to be the glue. I’ve gently scraped them away as it’s hindering the adapter refitting into the casing. Unlatch the copper shielding on the side with the orange tape. Then you will get to the circuitry after lifting the inner copper shielding. 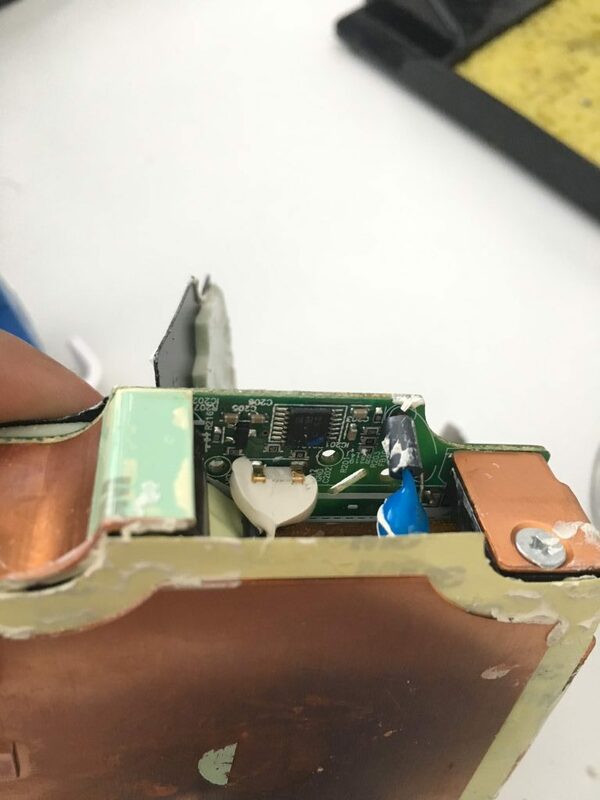 Depending on your soldering skills, a 75 degree bend on the inner copper shielding should be more than sufficient to get to the two soldering points. Remove the orange tape, it should be out with a slight pull. 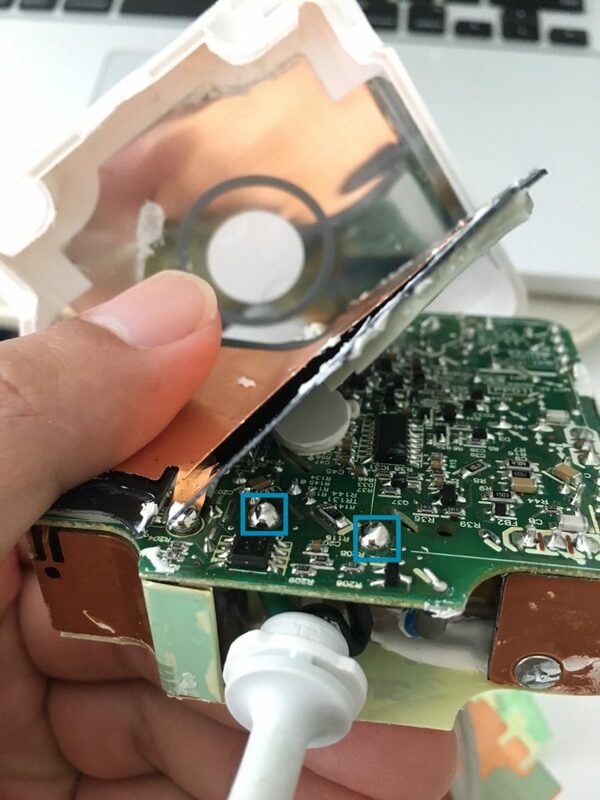 Do not remove the white gunk blob between the green and black wires. So we are ready to desolder the two points. The point on the left (green wire beneath) belongs to the positive terminal. The point on the right, leads to a black wire, for a negative terminal. 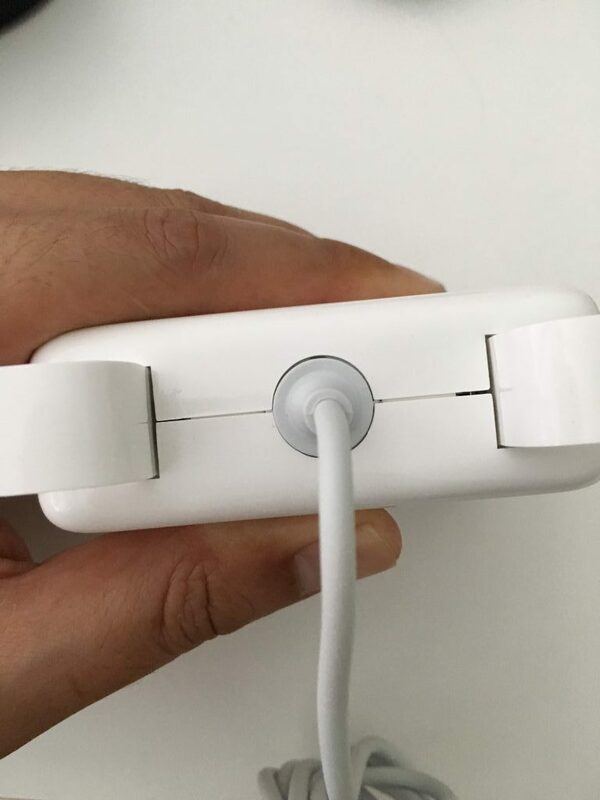 I’m a big fan of the Apple Magsafe (1 & 2) technology where the charging cable is magnetically attached to the laptop. Any accidental trips over the AC adapter and charging cable, doesn’t pull the entire laptop off the table. 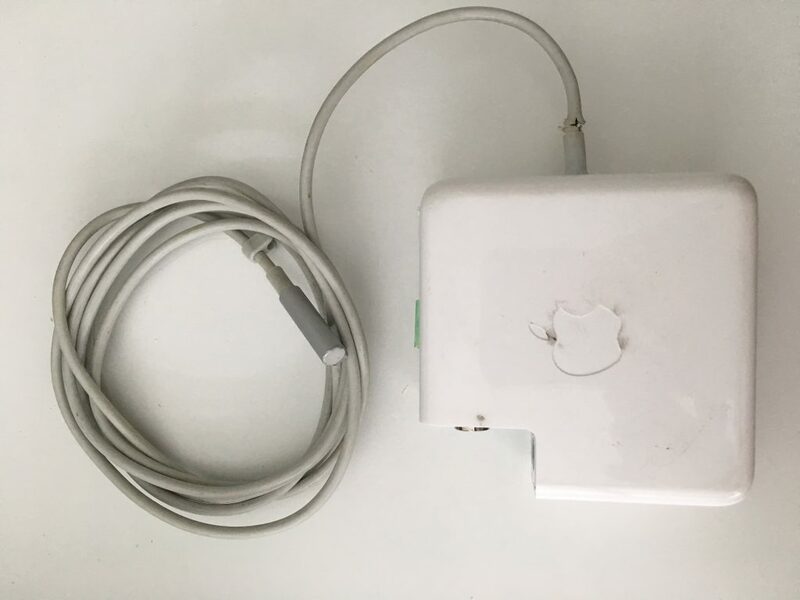 Why did you (Apple) discontinue the Magsafe technology? What a shame! 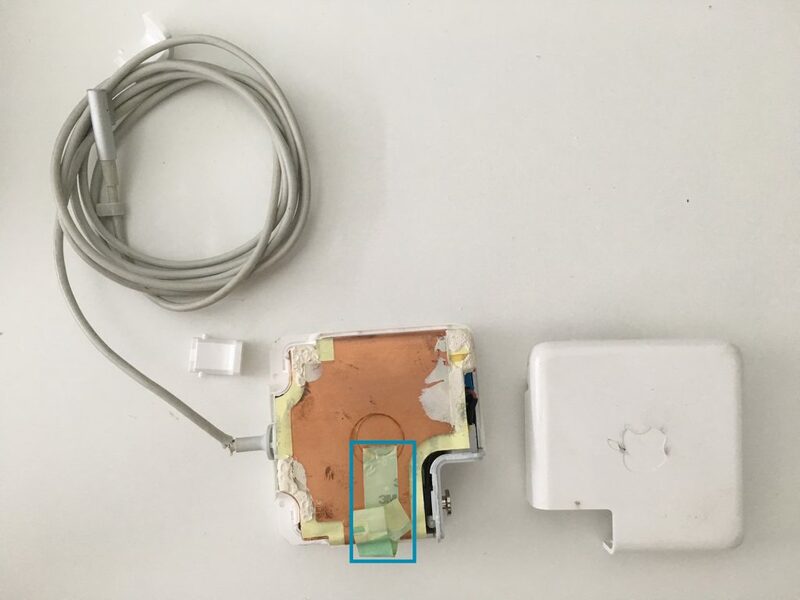 Although I like the Magsafe technology, I am not a fan of the ac adapter build. 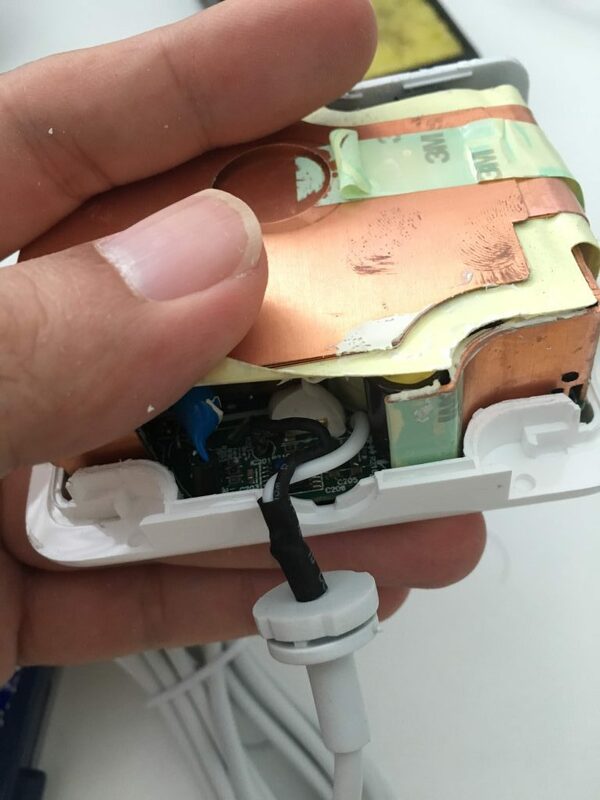 The charging cable is usually the first to be damaged, as what I’ve found out on the web. It also happened to my AC adapter cable. I decided to go with the replacement of the charging cable. It practically cost nothing apart from the time I spent and the replacement charging cable, since I’ve got the tools in place. Leave the AC adapter unplugged for a few days. This is to discharge the electrical energy in the adapter or you might get a shock while disassembling it. In my case, I left it alone for nearly a month as I was waiting for the replacement cable to get shipped in from China. 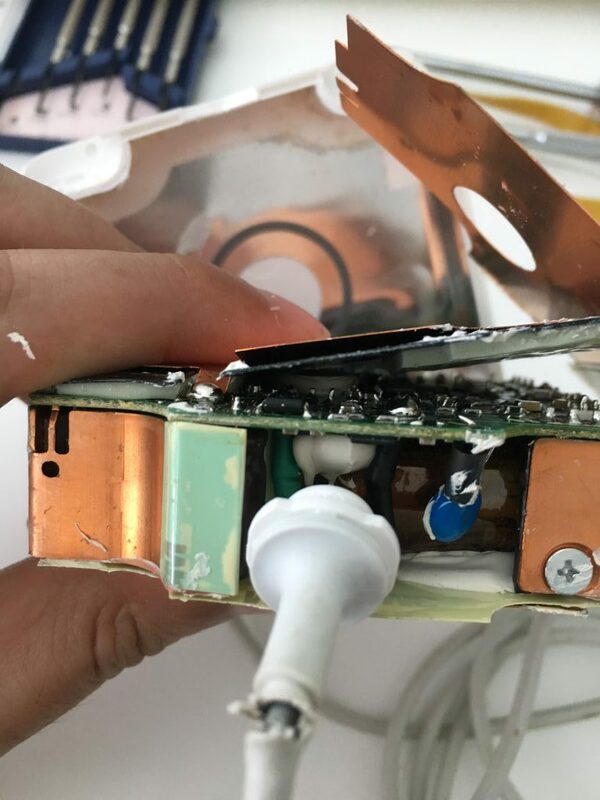 You should have some understanding on how to use a soldering iron, solder sucker. I had a friend who called out for car battery replacement assistance via WhatsApp this morning. Unfortunately, regulars in the chatgroup aren’t available to assist. Thought that a roadside service (common repairs or replacements) provided by Grab/Uber would make most sense, like Massage on delivery by GoJek in Indonesia. Let’s what can Grab/Uber Roadside provide? Posted on June 3, 2017 Categories ideasLeave a comment on Grab/Uber Roadside?